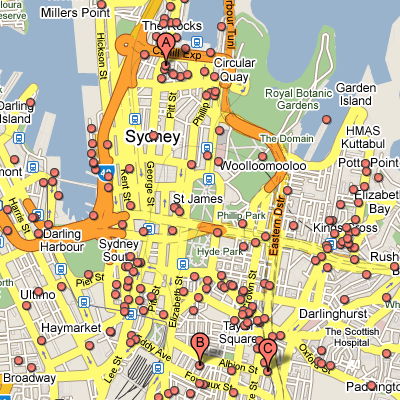 My coworker Berni, who travels a lot, says he's going to put this feature to use when visiting a new city -- for example, he can search for dancing sydney and look at where the results are clustered to plan his night out. Or, you might be in New York and searching for places convenient to your particular subway line. Now you can visually scan the results with a query like wine New York, then pan down into Brooklyn to see more options. We're initially launching this feature for maps.google.com, but stay tuned for it to be available on other domains in the near future. Update (3/9): I'm happy to announce that this feature is now available for all Google Maps domains, so now you can put it to use wherever you are. Enjoy! Ever wish you could see more than just ten local search results at once? Us too. So we've added a search layer for local search results that activates when there are more relevant results than we can show on one page. 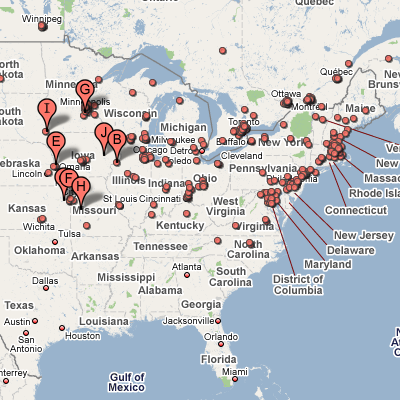 Instead of just plotting the first page of business results on our map, we plot more of them as small circles. You can click on the circles to get more information about the businesses they represent. The top ten results will still appear in the left-hand pane and as pins on the map. For example, there might be a coffee shop just around the corner from your house in Seattle, that didn't make it to the first page because Seattle has so many coffeehouses. 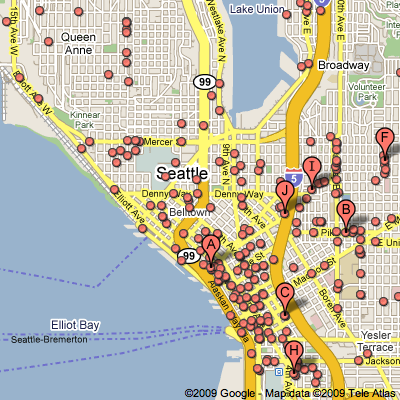 You can now browse for it with the query: coffee in Seattle.